The Bosch GRL 500 HCK offers fully automatic dial-in slope and centerline modes for consistent leveling to 1650 ft. Lithium-ion power is behind a system that fast charges laser and receiver at the same time. The remote/receiver is 2 devices in 1, so all information is in hand for easy 1-person operation. An industry-first theft deterrence alarm offers user peace of mind. A built-in calibration reminder advises user on calibration state and helps avoid expensive mistakes. 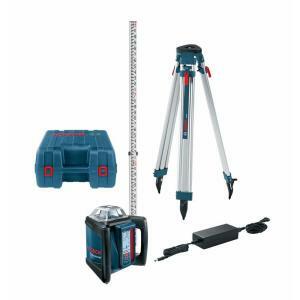 Tbook.com crawls the web to find the best prices and availability on Levels and related Tools and Hardware products like Bosch 1650 ft. Self-Leveling Rotary Laser Level Kit with Fully Automatic Dial-In Slope. For this page, related items include products we find that match the following keywords: "Level" at our vendor partner Home Depot. Bosch 1650 ft. Self-Leveling Rotary Laser Level Kit with Fully Automatic Dial-In Slope is one of 154 Levels and related products listed in the Tools and Hardware section of Tbook.com If you have any questions on this product, please give us a call at 734-971-1210 during the hours of 9am - 5pm EST for assistance. Thank you for shopping at Tbook.com, the Internet Department Store!